I put this tour together with considerable help and assistance from Melanie Brown of About Australia. For the most part, I kept her style and format for the itinerary. only changing the use of singular second person “you” to third person plural of “we.” In a number of places I kept in the British spellings such as “harbour” and “colour.” Click on any pictures to enlarge them–several are short videos. Then hit your back button to return to the itinerary. Click here to see a summary of what all is included. When reading the itinerary, realize that breakfast is served daily–spend the night in the hotel, enjoy breakfast the next morning. One other meal is included as part of the tour, either lunch or dinner–every day. A third meal is on your own. This itinerary is still a bit “under construction.” The dates, cities, flights etc. will stay the same. There are a couple of minor details still up in the air. Depart LAX on Air New Zealand on NZ#001 at 8:55P Notice that we lose February 11 to the International Date Line. Shortly after departing Los Angeles we will be served dinner and will be given breakfast before landing in Auckland. Relax, watch some movies, and try to get some sleep! Please confirm with the airline at Check-in that they have all your United Airlines Frequent Flyer information on record. Arrive Auckland, New Zealand, at 6:45A. 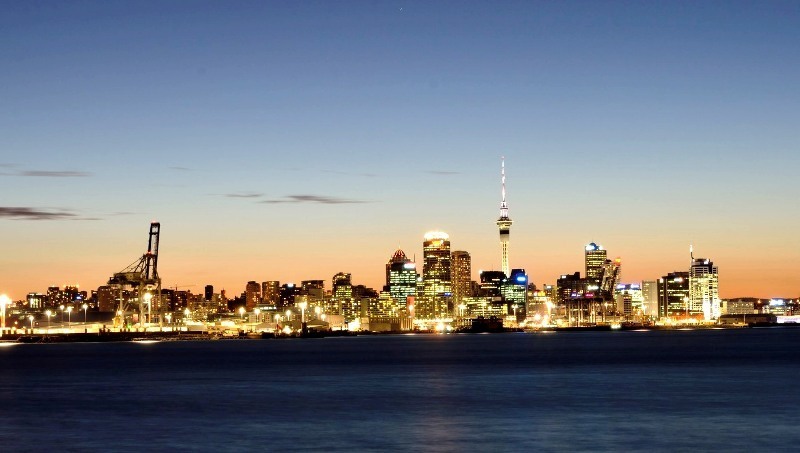 Aukland is known as the “City of Sails” since it is surrounded by the beautiful Waitemata Harbour which boasts over 15 islands and was the venue for the International America’s Cup yachting race. Within half-an-hour of our Auckland accommodation, we can relax on an island in the Hauraki Gulf, trek through native rainforests (one of the only places outside the tropics where rainforest exists), sample wines from a range of mainland and offshore vineyards and walk along a black sand surf beach. Our hotel rooms are well appointed and designed for comfort and convenience. Fitted with cutting-edge technologies to support the modern lifestyle of today’s modern business and leisure travelers, rooms are fitted with flat screen TVs, satellite channels, WIFI and spacious working desks. Transfer from airport to the hotel and check-in. Our rooms probably won’t be ready so we will go see the city on a Hop-on, Hop-off bus. The Hop-on, Hop-off Soaring Kiwi Tours provides new, double-decker buses. With a mix of open and closed top buses, we will ride in comfort and style, enjoying spectacular views from the top deck. The friendly local guides provide a ‘live’ fun and informative commentary throughout your journey. Multi-lingual commentaries are also available on the central tour. As we circumnavigate the city, visiting historic landmarks and all the ‘must see’ attractions, you can hop on and off at your leisure to ensure you don’t miss a thing. Return to the hotel for a shower and short nap. Dinner and overnight in Auckland. Experience New Zealand’s rich cultural heritage and the geothermal wonderland of Rotorua, plus a trip through the famous glowworm caves at Waitomo, on this full-day sightseeing tour by deluxe luxury coach. 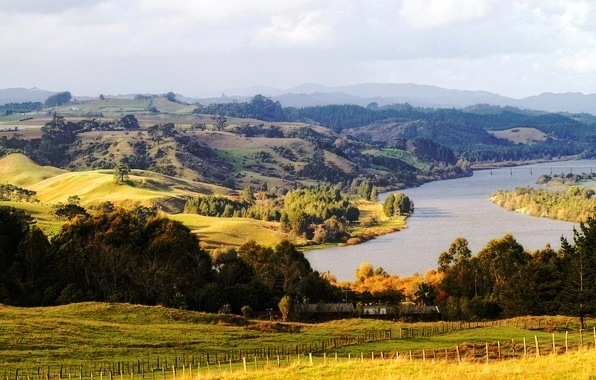 Waikato: Travel through New Zealand’s largest dairy and sheep farming province. See the small farming settlements on the outskirts of Hamilton City, as you travel towards King Country, the birthplace of the Maori Monarchy. Located on the shores of picturesque Lake Rotorua with commanding views over the lake and surrounding hinterland, our 2-night accommodation is just a few minute stroll to the city center. Our 4-star accommodation features the best of everything in Rotorua! The spa and fitness club has combined the benefits of the areas geothermal waters, culture, and relaxation to enhance a holistic sense of wellbeing. 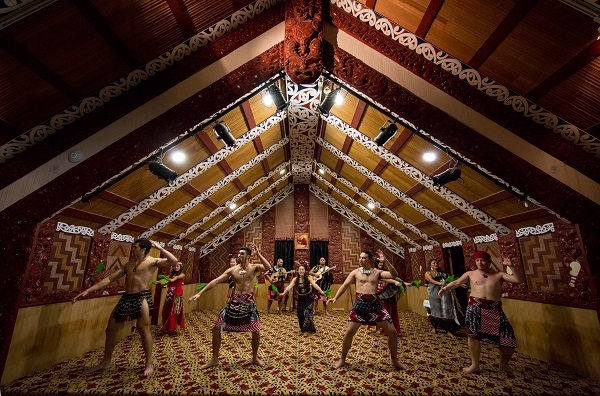 Take some time to experience the Matariki Cultural Centre and encounter the warmth and spirit of the Maori people. Setting out from Rotorua, the Hobbiton Movie Set tour starts with a scenic drive across the Kaimai Ranges to Matamata, a small town in the Waikato region known for its thoroughbred industry and dairy farming. Along the way, our local driver guide will provide informative commentary and share stories about the region and its history. Just outside of Matamata is the private working farm that was transformed into The Shire for the award-winning The Lord of the Rings and The Hobbit movie trilogies. The home of Tolkien’s beloved hobbits Bilbo, Frodo, Sam, Merry, and Pippin has been preserved since filming wrapped, and now draws visitors from around the world. Take a guided tour of the movie set and learn how this picturesque farmland was transformed into a living, breathing piece of Middle-earth. Our guide will show us Hobbit holes, the Green Dragon Inn, the Party Tree, the Mill and many other structures from the movies. After the Hobbiton movie set tour, return to Rotorua, arriving at approximately 1 pm. Our evening begins with a visit to the hangi pit to watch the baskets being lifted from their distinctive underground oven in preparation for the evening’s traditional feast. Hangi preparation begins in the early afternoon to ensure our dinner is cooked to perfection. 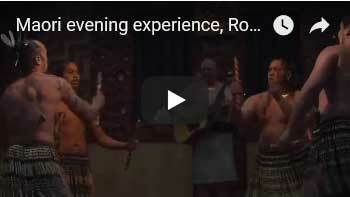 A true highlight of any Te Puia outing is the stunning cultural performances featuring traditional storytelling and entertainment. We’ll have the opportunity to join in the graceful poi dance or ferocious haka for a more intimate Maori cultural experience. After a traditional blessing, we will be treated to an entrée of New Zealand mussels, corn on the cob, traditional rewana bread and dips, and a local drink made from kawakawa extract and manuka honey. The main meal is an event in itself, with the hangi-cooked foods accompanied by flavoured meats, chicken, lamb, vegetables, and salads. A range of drinks is available to complement the meal including wine, beer, juices, tea, and coffee. Leaving room for dessert is highly recommended, as you will definitely find something to satisfy your sweet tooth. After dinner, we will be invited to board the motorized waka (transporter) for a journey into the valley at night. 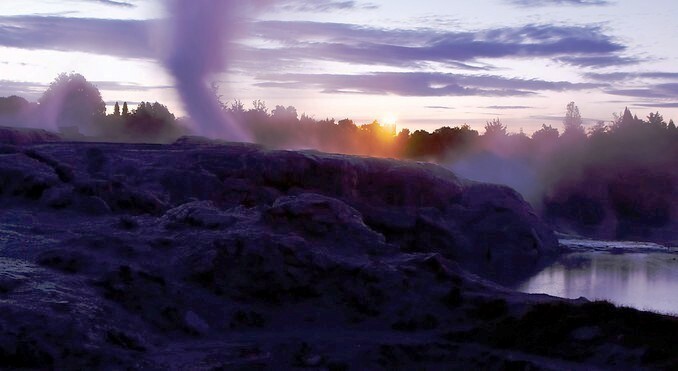 Enjoy the ride and marvel at the sights before disembarking at Pohutu Geyser for the final stage of a magical evening. The unforgettable evening ends by sitting upon the warmth of the naturally hot rocks armed with a delicious hot chocolate. Our guide will tell stories while Pohutu Geyser sits before us, illuminated in its full glory beneath starry skies. Travel by shuttle from our hotel in Rotorua, New Zealand, to the Airport. Travel by shuttle from the Airport to our hotel in Queenstown, New Zealand. Our hotel is situated on pristine Lake Wakatipu, an easy five-minute level walk from the centre of town. 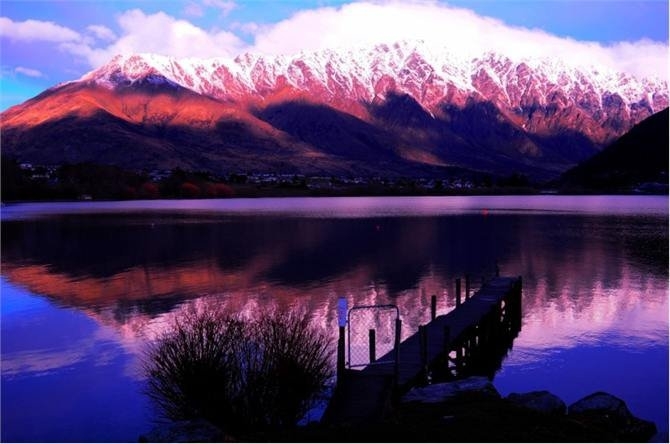 Many of the resort’s hotel rooms and two and three bedroom suites offer superb views of the stunning lake and picturesque Remarkables Mountains. A breakfast lounge, outdoor barbeque area, and sauna and gymnasium are also available onsite. 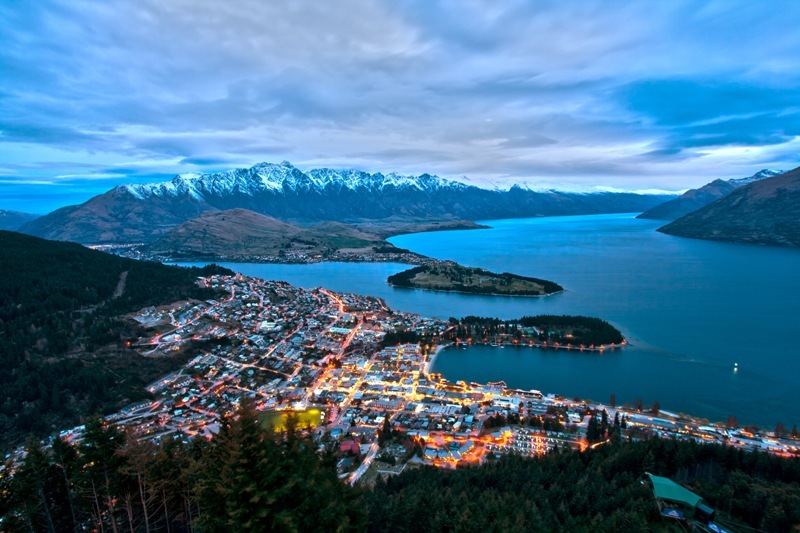 The property is located near dozens of restaurants, outdoor cafes, and pubs that occupy the breezy waterfront and easy-going pedestrian malls of central Queenstown. Numerous shops offer adventure activities that have made this area famous – from bungy jumping and winter skiing to cruises through picturesque Milford Sound and tramping across the spectacular terrain. -Boasts stunning lakeside accommodation, just 5-minutes walk from the centre of Queenstown, one of the world’s favourite adventure destinations. -Located on the shores of Lake Wakapitu, 15 minutes from Queenstown International Airport on New Zealand’s South Island. Gaze in awe at panoramic views of Queenstown before we sit down and enjoy a truly unique New Zealand buffet. Marvel at the stunning views as we ride the Skyline Queenstown Gondola – the steepest cable car lift in the Southern Hemisphere! Sit back and relax as the best views in the region unfold before our eyes and the Gondola carries us 450 metres above Queenstown and Lake Wakatipu to the top of Bob’s Peak. En route you will enjoy a spectacular 220-degree panorama, with breathtaking views of Coronet Peak, The Remarkables, Walter Peak, Cecil Peak and over Queenstown. On arrival, there are purpose-built viewing platforms and outdoor terraces that provide great photo opportunities. After the Gondola ride, we will step foot in one of the best restaurants with a spectacular lake and mountain view. The famous Taste of New Zealand buffet offers delectable fresh seafood, salads, roast meats and delicious desserts, while the panoramic view from our windows will captivate you day or night. It’s the ideal place for that special night out and the best place in Queenstown to watch the sun go down! With live music creating a relaxing atmosphere and never-ending scenery to admire, you will be entertained as you dine on the award-winning cuisine. Take an unforgettable journey into the heart of Milford Sound, New Zealand’s most famous tourist destination. we’ll experience the world-famous fiord in all its natural glory – surrounded by dense rainforest, glacier-carved valleys, and beautiful waterfalls. Today we will visit Milford Sound and experience a world of cascading waterfalls, sheer rock faces, and dense rainforest. Our sightseeing tour to Milford Sound is made even more enjoyable by our glass-roofed coaches, which provide spectacular panoramic views as we travel along the Milford Road – one of the world’s most scenic roads – and through the Homer Tunnel, before arriving for our Milford Sound cruise. Enjoy striking views of iconic Mitre Peak from the head of the Sound – it rises 1,692 metres from the south shore and is named for its resemblance to a bishop’s mitre (headdress). Upon leaving Queenstown, we will travel in comfort through rugged mountain terrain past Te Anau, a quiet town on the shores of the largest lake in the South Island. Our glass-roof coach will provide amazing views of the skyline. Our journey continues through the Southern Alps and along the picturesque Eglinton Valley, a place of ancient alpine forest and gushing waterfalls and one of only a few road-accessible glacier valleys in New Zealand. 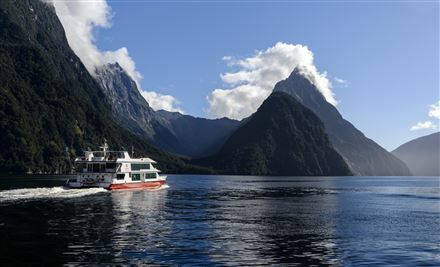 At Milford Sound, board the 1 3/4 hour Southern Discoveries Scenic Cruise and set off to explore the region that Rudyard Kipling called the Eighth Wonder of the World. Travel the length of the fiord and out to the Tasman Sea, gliding past glacier-scarred rock walls and waterfalls that tumble through valleys and crash into the sea far below. Lush native forest clings to steep cliffs, while seals, penguins, and dolphins are regular visitors to the icy waters. At the pinnacle of the sound, Mitre Peak rises dramatically from the depths to a height of 1,692 metres above sea level. Along the way, our captain will provide lively and informative commentary. After the cruise, we will return to Queenstown by coach. Alternatively, book a scenic flight option (optional extra) and wing your way back high over the mountains, lakes, and rivers of the South Island. After a week of activity, today’s morning and afternoon are free. Evening dining experience that’s unlike any other in Queenstown (or perhaps the world), at the Colonel’s Homestead Restaurant at Walter Peak High Country Farm. Steeped in Queenstown’s pioneering history, your experience starts with a cruise across Lake Wakatipu in the 100-year-old steamship, the TSS Earnslaw. 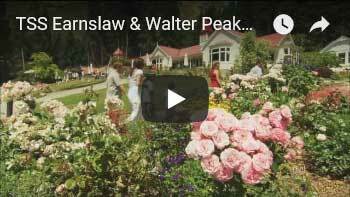 Then disembark at Walter Peak High Country Farm, one of the first farms set up in the region. Relax in the unique ambiance of the Colonel’s Homestead Restaurant, the heart of the stately homestead at Walter Peak. Here, we’ll enjoy a Gourmet BBQ dinner which our chef will prepare in front of us. Our new menu includes an expansive array of New Zealand and local produce, from succulent meats cooked on the outdoor rotisserie or grill, a selection of delicious vegetables and salads. Then finish the meal with our irresistible desserts, New Zealand cheeses and freshly brewed tea & coffee. After dinner, an entertaining and informative demonstration gives you a glimpse of life in the high country. On the magical night-time cruise home, enjoy the camaraderie of a sing-a-long with the ship’s pianist or breathe in the fresh night air on the moonlit decks as you watch the lights of Queenstown draw nearer. 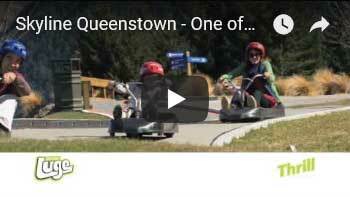 Travel by shuttle from our hotel in Queenstown, New Zealand, to the Airport. After departing from Queenstown, this short International Flight takes us overseas to Sydney, Australia. 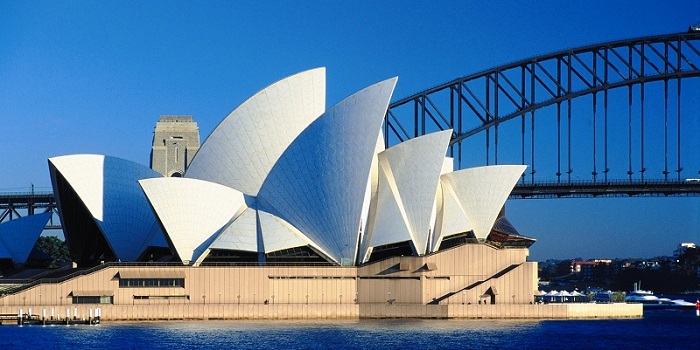 Travel by shuttle transfer from the Airport to our hotel in Sydney, Australia. Depart your hotel for an unforgettable Panoramic Sydney half day city sights tour. On tour, we’ll visit the historic Rocks area and hear early convict history. Enjoy magnificent views of the Opera House and Harbour Bridge. See the shopping heart of the city, QVB, Centrepoint. Visit Sydney’s trendy new district Oxford Street. Travel through elegant Paddington with its terrace houses before arriving at the Pacific Ocean. See the superb coast cliff walk around Tamarama and Bronte. 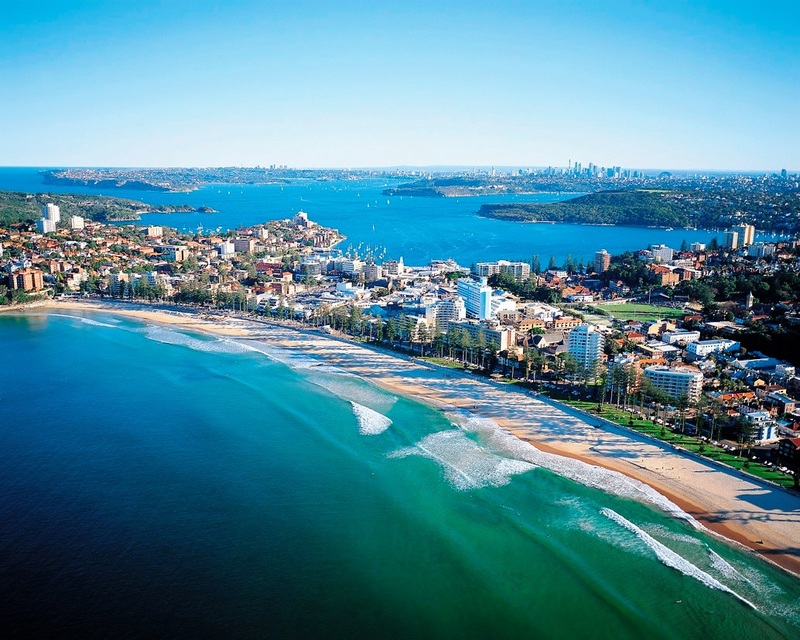 Travel on to famous Bondi Beach. Visit the beachfront promenade, enjoy a coffee or cool drink (at own cost). See bronzed Aussie lifesavers and Sydney’s best panoramic view at Dover Heights. Return to Sydney via Double Bay, Kings Cross and Mrs Macquarie’s Point for a final magical viewpoint over the harbour before returning to the city centre. Passengers can join our optional harbour lunch cruises or seaplane tours (additional expense). The designated harbour lunch cruise drop-off point is Darling Harbour (adjacent to the aquarium). If you do not wish to join a lunch cruise you will be returned directly to your hotel. This one hour tour outlines the intricate and controversial history of the Sydney Opera House along with details of the unique design of this architectural masterpiece. We will visit a number of the six performance venues, including the magnificent wood paneled Concert Hall and the Opera Theatre as well as the new Utzon room. You will also visit the glass-enclosed northern foyer areas which boast spectacular views of Sydney Harbour – a perfect photo opportunity. Tonight we are treated to one of Sydney Harbours most sensational sunset dinner cruises. Offering a unique and exclusive cruise experience, our personal host will cruise back in time, sharing the rich history of Sydney Harbour and its foreshore. Cruise around the harbour and explore the historical and modern highlights. Enjoy the sunset over the water as you anchor for a 3-course BBQ Dinner (upgrade to premium seafood platter available). The Blue Mountains Deluxe Day is a real journey into the heart of a unique World Heritage Region. From temperate rainforests to towering sandstone escarpments, we’ll see and experience it all. Join us, let the landscape work its wonders and become part of you for a lifetime. Upon departing from the city we travel directly to the Blue Mountains and our first stop of the day is at Calmsley Hill Farm a working farm also home to Kangaroo, Emu, Wombat, and Koala. Enjoy morning tea and time to wander at leisure. From Calmsley Hill we continue to ascend the Blue Mountains via the highway. We will visit one of a range of stunning outlooks of the Jamison Valley seeing beautiful vistas. Where possible this will be away from the crowds of tours that visit the mountains each day with other operators, thus we will enjoy a stress and hurry-free environment taking in the views and information imparted by our guide. Continuing on we arrive at Eaglehawk Lookout, a remote lookout points away from the crowds for views of the famous 3 Sisters. Whilst the Blue Mountains feature so much more than this natural attraction you can’t help but admire the unquestionable beauty of this amazing rock formation. The character of the Three Sisters changes throughout the day and throughout the seasons as the sunlight brings out the magnificent colours. Here our guide will discuss the legends behind this famous rock formation and time available for you to take some great photos. We then make our way around the mountain towards the village of Blackheath and our lunch venue the Hydro Majestic. Here in this relaxed venue with stunning views, we will enjoy a 2-course lunch with tea/coffee. All diets are catered for (excluding Kosher Meals). Beverages can be purchased at your own expense from the Bar. The afternoon is spent visiting a selection of lookouts. 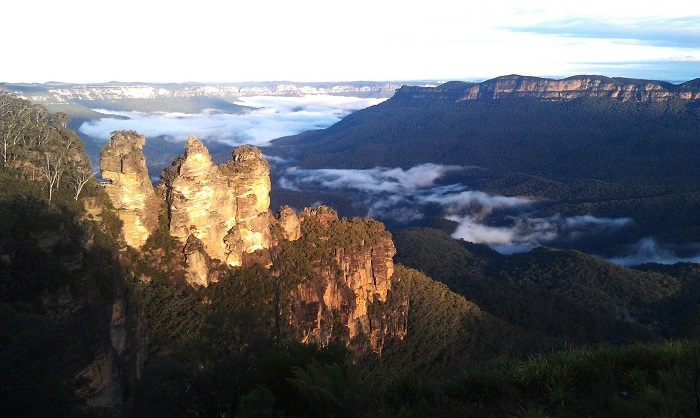 Once you clap your eyes on the view from Govetts Leap you’ll know why it’s one of the most famous lookouts in Australia. The magnificent waterfall drops a whopping 180m to the base of the cliff. If you’re not mesmerized by the dancing waves of water spray, you’ll be transfixed by the sweeping views down the valley to the Grose Wilderness. We then stop briefly to enjoy a glass of sparkling wine or orange juice at the delightful Mt Tomah Botanic Gardens our last stop, where we enjoy the sweeping views across to Sydney before travelling down the Bells Line of Road to arrive back at your hotel approximately 4:30 pm. Travel by shuttle from our hotel in Sydney, Australia, to the Airport. Travel by shuttle from the Cairns Airport to our hotel in Cairns, Australia. Our 4.5-star accommodation combines contemporary decor with a tropical ambiance. The magnificent location of this 176 room hotel is perfect for exploring the Great Barrier Reef, the Daintree Rainforest or Kuranda and the Atherton Tablelands. Other nearby highlights include Cairns Casino, Marlin Jetty, the Esplanade and the Night Markets. Unwind with a cocktail by the pool or bar followed by a sumptuous meal at the award-winning Bushfire Flame Grill. All rooms and suites have individual balconies, individually controlled air conditioning, refrigerator, television, broadband internet access, hairdryer, iron and ironing board, along with tea and coffee making facilities. Facilities include: 24 hr reception, tour desk, wireless internet, Bushfire Flame Grill, bar, pool, business services on request, coin operated laundry on four floors, room service, laundry & dry cleaning. 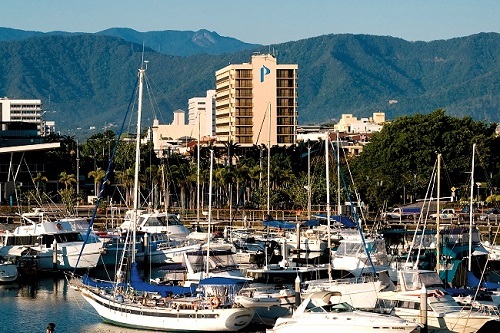 A Cairns Dinner Cruise is the perfect way to end a perfect day in paradise. Set sail aboard the newly refurbished 26-metre catamaran on the calm waters of Trinity Inlet, for an evening of dining, entertainment, and panoramic mountain and city views. The ultimate in waterfront dining, our cruise includes a gourmet buffet-style dinner, complimentary beverage on arrival, live entertainment, and (optional!) dancing after dinner. A selection of beverages and cocktails are also available for purchase from our fully licensed bar. Today we’ll go on a cruise on a catamaran to an all-weather platform on the Great Barrier Reef, one of the natural wonders of the world, and not surprisingly the world’s most extensive coral reef. 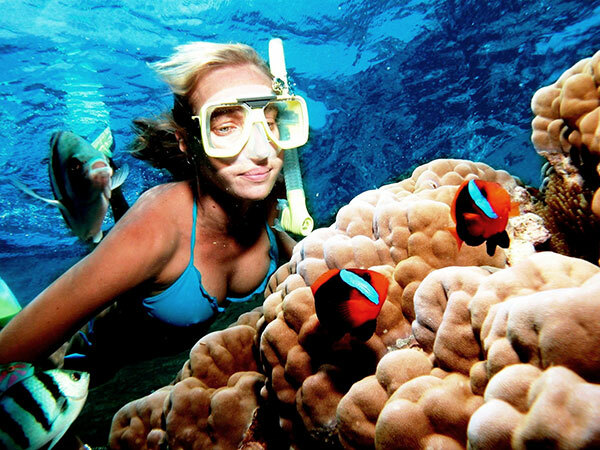 On arrival at the Great Barrier Reef, you will be provided some handy tips on the correct use of snorkeling equipment and then help fit you with a mask, snorkel, and fins so you can take to the water with confidence. The snorkel area is supervised at all times and personal flotation devices are readily available in adult and child sizes. Stairs lead down from the main deck to a submersed snorkel platform where you can sit down and put on your mask and fins. Access to the water could not be easier with the snorkel platform opening directly into a shallow, bright and sheltered coral lagoon. Floating snorkeller rest stations are strategically located around the site where you can take a rest at any time. This prevents tired snorkellers standing on and damaging the corals and is part of our commitment to ensuring our site is kept in its current pristine condition. Also included is a range of activities and facilities for the non-swimmer or those simply wanting to take time out of the water: the Semi-Submersible, the Glass Bottom Boat and the Underwater reef viewing observatory all offer experiences with different perspectives. At lunchtime, our Marine Biologist will announce the fish feeding demonstration which starts in front of the observatory windows before moving to the snorkel platform. The feeding frenzy includes large schools of Red Bass, Trevally and the star of the show, Wally, our resident Giant Maori Wrasse! A wonderful day awaits as we are transported on the historic Kuranda Scenic Rail to Kuranda, our Kuranda Boarding Pass enables us to avoid the ticketing lines, as seating has been pre-allocated. Rainforestation, set in 40 hectares of lush gardens, is our next stop. Board the amphibious Army Duck, see unique tropical fruits, ancient rainforest plants & native animals, before a performance by the Pamagirri Dancers. A BBQ lunch is included as well, then it’s time to board Skyrail for our return journey. Check in: Our Driver will meet us at our hotel and check us in for our tour using our Kuranda Boarding pass. The pass includes a detailed itinerary, pre-allocated preferential Kuranda Scenic Railway seating, map of Kuranda, and discounted entry into selected Kuranda attractions. 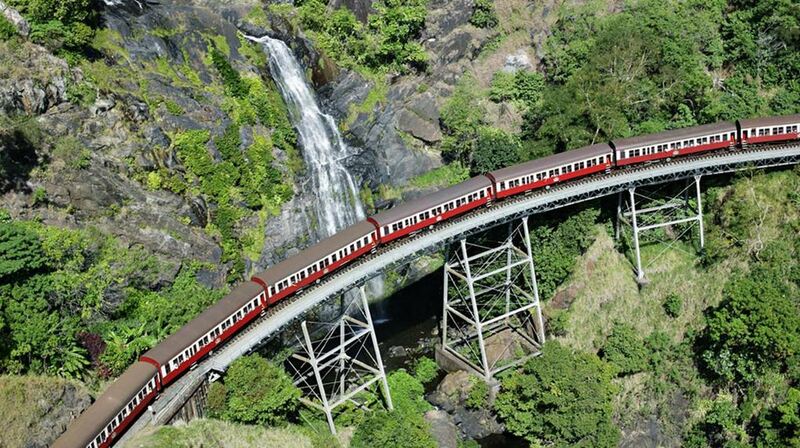 Kuranda Scenic Rail: Boarding the famous Kuranda Scenic Rail, An amazing journey awaits as we travel one of the world’s most scenic rail routes, through hand-hewn tunnels and over bridges spanning spectacular gorges. Kuranda Village: Once we alight at beautiful Kuranda Station, we have ample time to explore the many and varied shops, as well as the Heritage Markets which operate daily. 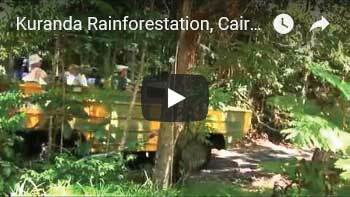 Rainforestation: A shuttle coach will transfer us to Rainforestation, set in 40 hectares of lush gardens and tropical rainforest, a number of unique attractions await. Board the unusual amphibious Army Duck for a different look at the rainforest. An experienced guide will show us unique tropical fruits, ancient rainforest plants and point out a number of the native animals as we meander through the rainforest. Join the Dreamtime Walk for an insight into ancient Aboriginal Culture. The Pamagirri Dancers perform a range of native dances in the Rainforest Amphitheatre that reflects their humour and excitement of their culture. A delicious BBQ lunch is included before visiting the Koala & Wildlife Park. Cuddle a koala (own expense), smile at a crocodile and hand feed the kangaroos and wallabies before returning to Kuranda. Skyrail Rainforest Cableway: At our pre-allocated time board Skyrail, an experience which takes us over the rainforest canopy with stops along the way allowing us to take a stroll or visit the CSIRO Interpretive Centre. Our return transfer departs at 4.50pm where our hostess is waiting to assist you with our return transfer. Travel by shuttle from our Cairns hotel to the Airport in Cairns, Australia. 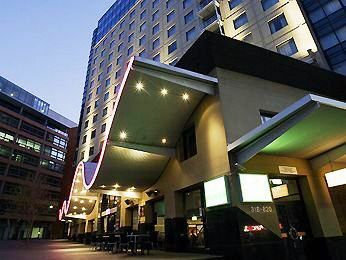 Travel to our hotel in the heart of Australia, the Red Centre, where we will be staying for 2 nights. Our 4 1/2 Star hotel is centrally located to all resorts and Australia touring facilities and offers a range of stylish accommodations, from shaded poolside rooms to the magnificent deluxe rooms overlooking the desert. You can relax in the comfort of your own private balcony or courtyard, or unwind in the hotel’s refreshing pool, sipping cocktails. It’s only a short stroll to the resorts numerous lookouts, where you can view what is arguably Australia’s best sunset. Its spectacular display of colours across the face of Uluru and the surrounding desert turns your vacation into a memorable event. Our experienced driver-guide will give us an overview of the fascinating history of Uluru – Kata Tjuta National Park as we make our way to Walpa Gorge, a lush desert haven for plants and animals. The gentle but rocky track will lead us into a world of rare plant species and lush evergreen shrubs known as Spearwood. Time to head off to the Uluru sunset viewing area. On arrival, you’ll be served from a selection of Australian wines and nibbles. You can just sit and relax or stroll around the area to find your own personal space to watch an amazing Red Centre sunset. Enjoy tea or coffee and be inspired by an incredible view through stunning desert landscape as the sun rises over Uluru and Kata Tjuta. From the viewing platform it is possible to see way into the distance, providing an ideal photo opportunity. After the amazing sunrise and a relaxing morning tea, we will join a tour around the base of Uluru learning details of its geology and incredible history. 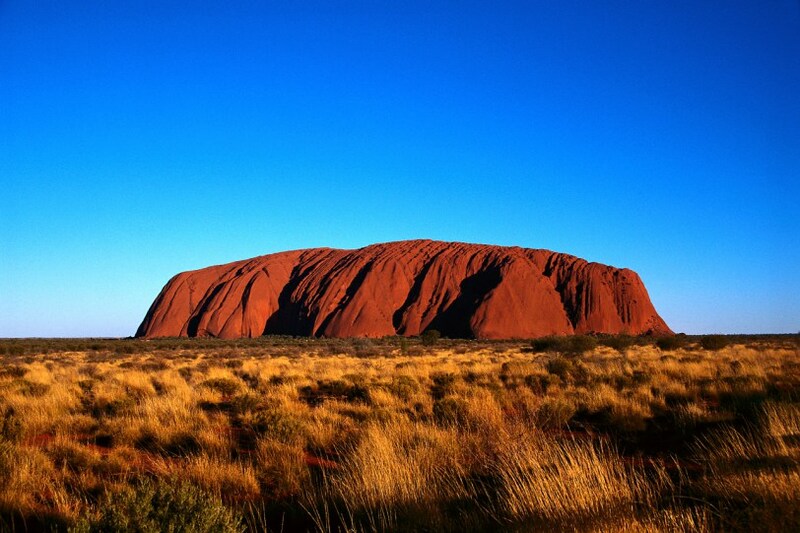 Last on the morning tour is a visit to the Mutitjulu Waterhole and the Uluru – Kata Tjuta Cultural Centre. 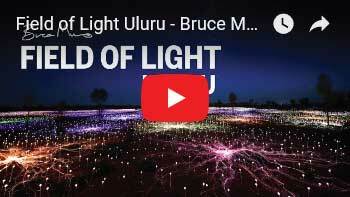 Field of Light Uluru will be in residence from April 1, 2016, to December 31, 2020, and features over 50,000 illuminated frosted glass stems covering an area the equivalent in size of four football fields, delivering travellers a truly once in a lifetime Uluru experience. One hour before sunset, travel into the desert where a magical landscape awaits you. The monolith and its surrounds will be transformed into a sparkling dream by British artist Bruce Munro. Experience Field of Light from the dune top viewing area with a dedicated Tour Leader. A delicious Australian buffet dinner will be served in this twinkling outdoor setting. Each family will receive a memento booklet of the experience. Travel by shuttle from the Airport to our hotel in Melbourne, Australia. 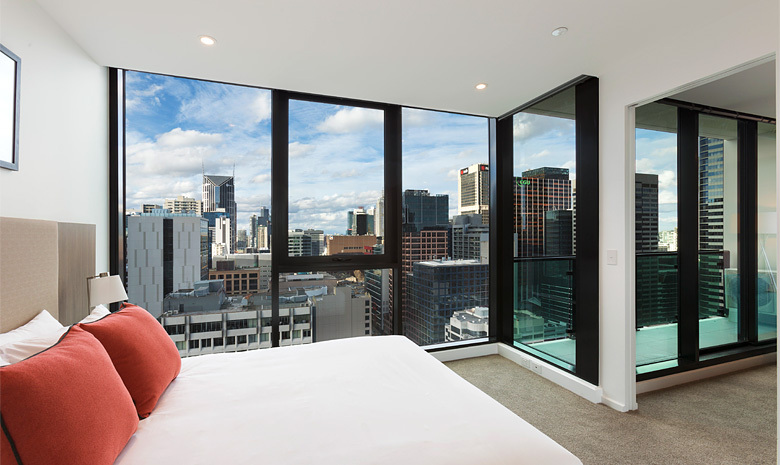 Enjoy the comforts of home in a Melbourne apartment-style accommodation located in the heart of Melbourne with easy access to renowned attractions! Each modern apartment is self-contained featuring large floor-to-ceiling windows, a private balcony and clearly defined living and dining areas. Equipped kitchens have stone bench tops, modern stainless steel appliances and a wide variety of cookware. Tiled bathrooms are equipped with a combo washing machine and dryer. Comfortable lounge areas include a Smart TV and BluRay/DVD player. Every apartment has individually controlled heating and air conditioning. We’ll also enjoy on-site reception, luggage storage, heated indoor pool, gym, BBQ Terrace and free high-speeded internet. We’ll be just a short walk from Spence Street Outlet, Southern Cross Station, Flagstaff Gardens & Train Station, Rialto Towers, Etihad Stadium, Hardware Lane, Melbourne Aquarium, Queen Victoria Market, Royal Arcade, Bourke Street Mall, Melbourne Central Shopping, Crown Melbourne, Harbour Esplanade & Federation Square. The apartment is serviced once per week but can be serviced daily for an extra fee. Get up close and personal with the friendly residents of Moonlit Sanctuary Wildlife Conservation Park, where you learn about the conservation of these loveable native animals. The eco-certified sanctuary also showcases some lesser known but equally adorable endangered species including the Southern Bettong, Eastern Quolls, and rare Fluffy Gliders. From there travel to Phillip Island where you see the Nobbies, and Seal Rocks before travelling on to Summerland beach for the nightly penguin parade. Home to Victoria’s largest colony of little penguins, Summerland beach provides a spectacular backdrop to the world famous penguin parade. Watch as hundreds of little penguins make their way across the beach and go home for the night. Come and enjoy the beauty and native wildlife and make this a journey to remember. Tour conclusion depends on the time of year and ranges from 10 pm during the winter months to midnight during summer as the penguins arrive at sunset. Enjoy an exclusive viewing area and private boardwalk situated next to the main path of penguins and limited visitor numbers, offering fantastic close viewing of penguins with rangers on hand to answer questions. I have deliberately left today free of scheduled activities, figuring that we need a bit of time to reflect on our adventures. If you are still up for more organized activities, tours are available. At night, we will cruise the scenic streets of Melbourne, enjoying fine cuisine and drink the very best of Australian wines. The atmosphere is cosy, the service friendly and the decor as inviting as the colonial period these trams reflect. 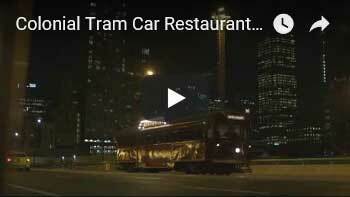 The Colonial Tramcar Restaurant officially commenced operation in August 1983. 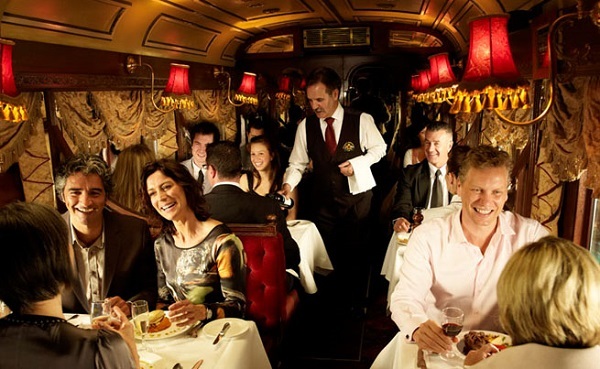 These glossy, burgundy restaurants on wheels are the first travelling tramcar restaurants in the world and ensure a delightful innovative approach to dining. Dining aboard the Tramcar is not only a culinary delight but also a trip into a little piece of Victoria’s history. After breakfast, travel by shuttle from our hotel to the Airport in Melbourne, Australia. Depart Melbourne at 12:10P on NZ124, arrive Aukland at 5:45P. Depart Aukland at 7:30P on NZ006, arrive at LAX at 10:30A. Our International Flight arrives in Los Angeles on the same day of departure from Australia, due to our crossing of the International Dateline. Ben Plummer gets to celebrate his birthday in three countries today–Australia, New Zealand, and the USA. This will slightly make up for all of the birthdays he has missed over the years due to having been born on the last day of February during a Leap Year.